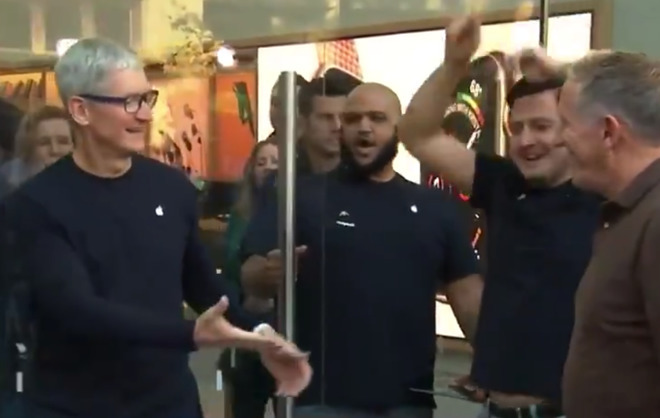 Apple CEO Tim Cook made an appearance at an Apple Store in Palo Alto, California, helping to open the store and welcoming the first people from the queue into the store to pick up their iPhone XS order. A regular occurrence for the CEO, Tim Cook stood inside the glass doors of the Apple Store just before opening time, reports CNBC. While the doors opened, a countdown was performed by staff, then cheers erupted as the first people in the queue made their way into the store. Cook himself stepped outside the storefront to greet the initial customers, shaking their hands and sharing a few words, as well as taking selfies. A few minutes later, Cook returned inside the store to continue meeting attendees. The appearance of the CEO at the Palo Alto store is a regular occurrence for the iPhone launches, with repeated visits and openings at the same store over the years. Aside from appearing in person at one location, Cook has also celebrated the launch on social media. In a Twitter post, the CEO advises he is "thrilled to get these new Apple product into the hands (and onto the wrists) of so many customers around the world," as well as highlighting some of the photographs taken at Apple Stores.